A current trend in picture book publishing involves scatological humour and an emphasis on what, in former days, were considered to be not-very-polite parts of the body. Some of this involves humour that is rather forced – vulgarity for the sake of vulgarity rather than fun – but Nicholas Allan, in cornering a share of this market, shows how ‘naughty bits’ can be handled (if I may put it like that) without being puerile. There was something of lèse majesté about his The Queen’s Knickers but now he shows that no matter big someone might be, they still need the services of lavatory paper. 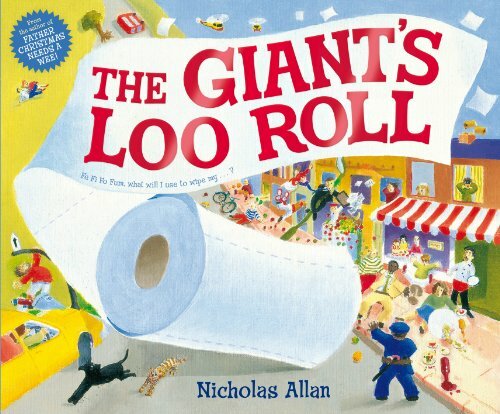 As the giant positions himself, he drops his enormous loo roll: ‘Oh, Fe, Fi, Fo! And Fe, Fi, Fum! Now what shall I do to wipe my …’ page turn ‘Bum-pety! Bumpety, Bumpety-Bump!’, Allan teases. Meanwhile, as the errant roll unwinds, sheets of it are grabbed and put to many good uses: a shop full of paper pants, multiple loo rolls, plates and hats for a children’s party. Eventually, the roll comes to a stop. Just in time too as the giant was in need of it. Astute readers, and market researchers, will wonder why he only had one roll in his bathroom, but maybe that’s another story. Like the runaway loo roll, the text bowls along, matched by Allan’s colourful depiction of its progress through town and country, scenes he captures with gusto and humour. All good clean fun and sure to be enjoyed by young readers.